September is the month that symbolizes diverse changes in our daily lives. Foremost it represents the transition from summer into autumn. With this change of season children's thoughts return to school whether they are beginning in kindergarten or finishing their upper division college classes. As adults we understand that the learning process in our lives continues until we take our last breath. Everyday we learn about ourselves and lifes responsibilities through interactions with nature and countless individuals in our family, neighborhood, school, workplace and societal institutions. The WASL educational system has become a complexity of facts, figures and percentages determining what to teach, how, when and where. Today children's schooling is based on the criteria that reflects our government's endorsed perception of life's essential reading, writing and arithmetic skills needed to get a good job, pay taxes and vote. Our actual challenge is to inspire young people to believe in themselves and encourage them to see the best in everyone and everything they do. 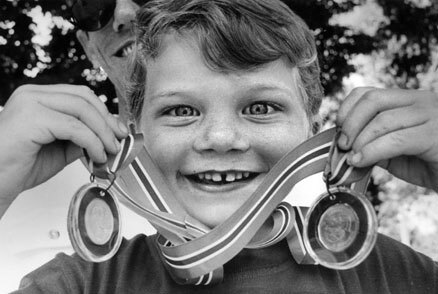 Jonathan Holmes (4) reflects his self-esteem after winning two events at this summers Icelandic picnic.